On average, 42 home candle fires are reported every day. More than half of all candle fires start when something that could burn, such as furniture, mattresses or bedding, curtains, or decorations is too close to the candle. In one-fifth (20%) of candle fires, the candles are unattended or abandoned. Over one-third (36%) of home candle fires begin in the bedroom. Falling asleep is a factor in 12% of home candle fires and 36% of the associated deaths. December is the peak time of year for home candle fires. In December, 13% of home candle fires begin with decorations compared to 4% the rest of the year. One-half of home candle fire deaths occur between Midnight and 6 am. The risk of fatal candle fires appears higher when candles are used for light. Put candles in sturdy metal, glass or ceramic holders. Consider using battery-operated or electric flameless candles and fragrance warmers, which can look, smell and feel like real candles – without the flame. If you do use candles, ensure they are in sturdy metal, glass or ceramic holders and placed where they cannot be easily knocked down. Extinguish candles after use and before going to bed. Set a good example by using matches, lighters and fire carefully. Never use a candle where medical oxygen is being used. The two can combine to create a large, unexpected fire. When using in home worship, don’t place lit candles in windows, where blinds and curtains can close over them, or pass handheld candles from one person to another. To lower the risk of fire, candles should be used by only a few designated adults. Remember! Candle fires are PREVENTABLE! Escape first, and then call for help. Develop a home fire escape plan and practice it frequently with your family. Designate a meeting place outside. Make sure everyone in the family knows two ways to escape from every room. Never stand up in a fire, always crawl low under the smoke, and try to keep your mouth covered. Never return to a burning building for any reason: it may cost you your life. 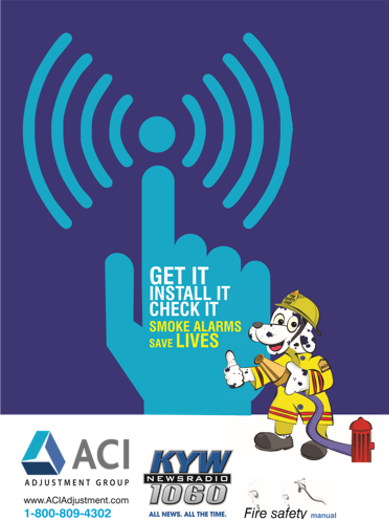 Finally, having a working smoke alarm dramatically increases your chances of surviving a fire.